US Secretary of State Rex Tillerson said the US is ready to have talks with North Korea without preconditions, taking a step back from an earlier stance that Pyongyang must first commit to nuclear disarmament before any negotiations with Washington. The change of tone comes two weeks after North Korea test-fired an intercontinental ballistic missile potentially capable of carrying a nuclear warhead to Washington. “We are ready to talk anytime North Korea would like to talk. 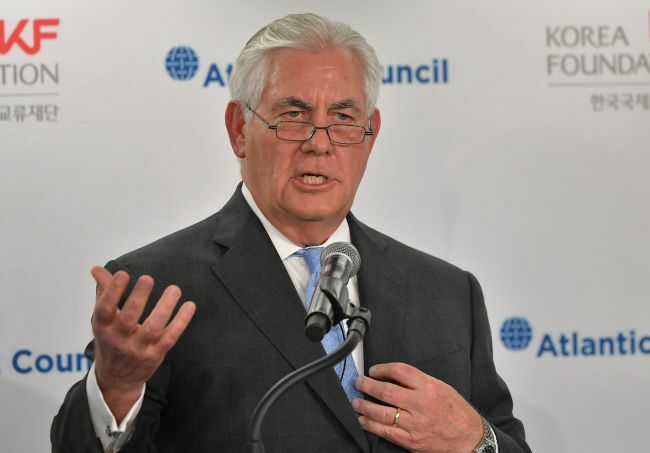 And we are ready to have the first meeting without preconditions,” Tillerson said, adding that there would have to be a “period of quiet” without nuclear and missile tests to have productive discussions. He reiterated Washington’s position that it cannot accept a nuclear-armed North Korea. It remains unclear whether Tillerson made the remarks with US President Donald Trump’s approval. In October, Trump said Tillerson was “wasting his time” trying to negotiate with North Korea, just as the secretary of state said the US had backchannel communications with the North. “The president’s views on North Korea have not changed,” White House spokeswoman Sarah Huckabee Sanders said in a statement later Tuesday. Speaking at an event for the British think tank Policy Exchange, McMaster said that the US policy is focused on the “denuclearization of the Korean Peninsula,” not ousting Kim Jong-un. That includes potential action against companies that illegally do business with North Korea, along with continued pressure on China to help curb North Korea’s nuclear tests, he said. Also on Tuesday, the United Nations’ political chief said that senior North Korean officials told him during his four-day visit to the country last week “that it was important to prevent war” over the North’s nuclear and missile programs. Jeffrey Feltman, a former US diplomat who is the UN undersecretary-general for political affairs, told reporters after briefing the UN Security Council privately that “how we do that” was the topic of more than 15 hours of discussions he had with the North’s Foreign Minister Ri Yong-ho, Vice Minister Pak Myong-guk and other officials. The North Koreans “did not offer any type of commitment” to future talks, but he believes he left “the door ajar,” Feltman said. Meanwhile in Pyongyang, North Korean leader Kim vowed to develop more nuclear weapons while awarding medals to scientists and officials who developed its latest ICBM. “(Kim) solemnly declared that the development of new strategic weapon systems including A-bomb, H-bomb and ICBM Hwasong-15 ... completing the state nuclear force serve as a great historic victory of our party and people of the country achieved by the death-defying struggle at the cost of high price,” Kim was quoted as saying by the Korean Central News Agency during a two-day munitions conference that ended Tuesday.